It's summertime! For many folks that means long trips across the state or the country. Road trips are an American pastime! While we saw a great dip in gas prices in recent months they are back on the climb, but regardless of the dollars and cents it always makes sense to do your darndest to get the best possible fuel economy. There's a few easy driving tips you can follow, as well as a couple maintenance procedures you can keep up with to ensure that your car is getting the best MPGs possible during this year's driving season. When you roll down the windows it prevents your vehicle from being aerodynamic, as it was designed to be. When all the windows are down it can decrease MPGs by as much as 10 percent! Tires that are not properly inflated will wear out faster than they should. The soft rubber also takes more power to turn. Ensure your tires are filled to the correct PSI before your next trip. A clogged air filter may prevent your vehicle from creating the proper air/fuel mixture it needs to run right. If the engine can't get the air that it needs it may compensate by burning excessive amounts of gasoline. If your vehicle needs to warm up for any more than a few seconds in order to drive right it means that something is amiss. You should also turn your vehicle off if you're going to be stopped for more than a minute or two. Modern vehicle's don't waste fuel when they start, but idling means you're getting zero miles per gallon. The spark plugs are what generate the tiny explosion that ignites the air/fuel mixture. If they are dirty or corroded they can misfire, which is a huge waste of gasoline. One of the most important things you can do for your vehicle to ensure that it is getting the best possible fuel economy is keep up with scheduled maintenance services. This includes oil changes, filter replacements and other services that are recommended by your vehicle manufacturer. The roads are calling, so get on them! But before you do be sure to prepare your car. For professional auto maintenance in Asheville that will surely help your vehicle get excellent MPGs make an appointment with the ASE certified technicians at The Organic Mechanic. We work hard to keep cars running their best! As a full service auto repair shop we conduct all sorts of services and we take the environment into consideration with every turn of the wrench. 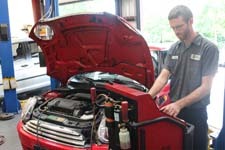 Give us a call at (828) 232-8120 to learn more about our green auto repair shop in Asheville.